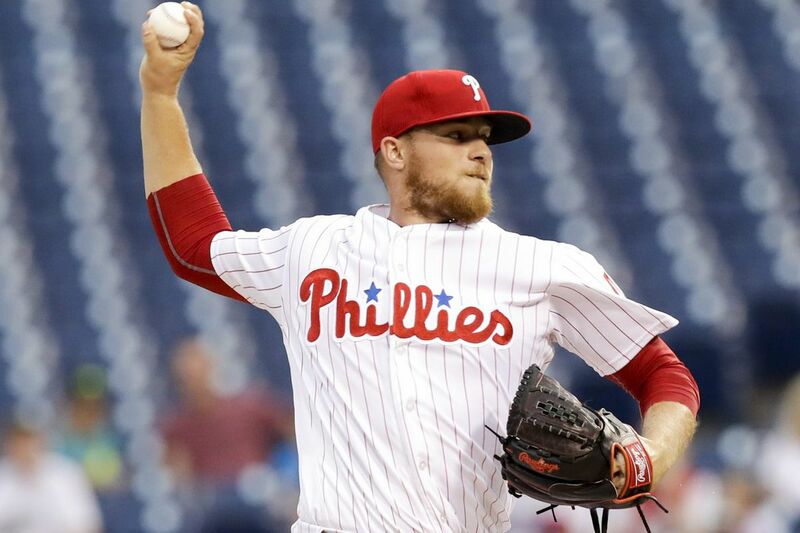 Jake Thompson pitching against the Braves last month. A once-touted prospect, he has been hit hard in the majors. When considering a performance like the one Jake Thompson turned in against the Angels last Wednesday, it can be helpful to remind oneself of the positives. Mostly, that consists of his age, which as of Monday was 23 years and 188 days. He wouldn't be the first pitcher to take a little while to figure himself out, and, with another option year remaining, he has some time to do it. The most discouraging development in the Phillies' rebuilding plan over the last year-plus has been the near-total failure of the young arms who once upon a time were supposed to be the strength of the upper levels of the minor-league system. There are other contenders for the honor, from Maikel Franco's regression to the struggles of recent first-rounders Cornelius Randolph (.747 OPS, 106 strikeouts, 366 at-bats as a 20-year-old at high-A Clearwater) and Mickey Moniak (.673 OPS, 89 strikeouts, 387 at-bats as a 19-year-old at low-A Lakewood). Still, the development of second-rounder Scott Kingery and fifth-rounder Rhys Hoskins and the emergence of Odubel Herrera and Aaron Altherr as potential future cogs help to even out the balance sheet on the system's hitters. The arms, on the other hand, have had little such luck. Zach Eflin, acquired in the Jimmy Rollins trade before the 2015 season, has a 5.79 ERA in 19 big-league starts over the last two years. Vince Velasquez, acquired in the Ken Giles trade in 2016, has done little to suggest that he will eventually become something other than a guy with a good fastball who walks too many batters, gives up too many home runs, and throws too many pitches to get deep into games. His six walks against the Rockies over the weekend marked the seventh time he'd walked at least three batters in a start this season. In 14 outings, he's averaging just five innings per start, with a 4.82 ERA. Mark Appel, also acquired in the Giles trade, has suffered a complete loss of the pinpoint command that prompted the Astros to draft him over Kris Bryant with the No. 1 overall pick in 2013. In 17 starts at triple-A Lehigh Valley, he has 53 walks against 60 strikeouts in 82 innings. That's not good. But it is Thompson who represents the biggest setback. When the Phillies acquired him from the Rangers in the Cole Hamels trade in July 2015, they appeared to be getting a legit power pitcher with strikeout stuff who would slot into their rotation-of-the-future with Aaron Nola. The national publications were unanimous in considering him a top-100 prospect before the 2015 and 2016 seasons. In 32 starts at double A, he averaged a solid 8.2 strikeouts per nine innings and 2.55 strikeouts-per-walk to go with his 3.56 ERA. While Thompson had an excellent 2.50 ERA in 21 starts at triple-A Lehigh Valley last season, his walk rate dropped to 6.0-per-nine, which foreshadowed an ugly 10-start run in the majors in which he struggled to miss bats and find the zone. By the end of the season, he had issued 28 walks against 32 strikeouts with four hit batters, four wild pitches, and 10 home runs surrendered in 53 2/3 innings. Against the Angels on Wednesday, he allowed 11 of the 25 batters he faced to reach base, five via extra-base hits, three of them home runs. The performance was sufficient enough to erase any memory of the five scoreless innings he'd tossed five days before. After the game, the Phillies optioned him back to the minors. In Velasquez, Appel, and Thompson, the Phillies have three onetime top-100 prospects who have yet to offer any reason to think that they will one day be competent members of a contending rotation. There have been some positive developments at the lower levels of the minors. The Phillies recently promoted 18-year-old sensation Sixto Sanchez to high-A Clearwater; he has the fastball to become the best Phillies pitching prospect since Cole Hamels. On Monday, they promoted 22-year-old Franklyn Kilome to double-A Reading; in 19 starts at Clearwater, he posted a 2.59 ERA with 83 strikeouts, 37 walks, and just five home runs allowed in 97 1/3 innings. But neither player figures to factor into Matt Klentak's plans for next year's rotation, which leaves the general manager looking at an offseason in which there are few easy answers. It will make little sense for the Phillies to get involved in the bidding for the top of the free-agent pitching class, which this year is projected to feature Yu Darvish, Masahiro Tanaka, and, in the next tier down, Lance Lynn and Jake Arrieta. At the same time, the Phillies entered this season thinking they would at least be able to compete on a nightly basis, with Pete Mackanin saying the goal was to be playing .500 baseball heading into the stretch run. They will enter Tuesday's series opener against the Braves at 29 games under that mark. Any serious attempt to cut into that difference will require a serious remodeling of a rotation that currently has no clear fixtures beyond Nola. At this point, it's tough to count on the help coming from within.